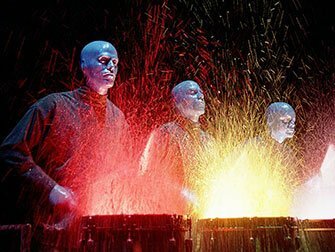 What to expect when buying Blue Man Group in New York tickets? This might not be very helpful, but the only way to understand this experience is by going to see the show yourself. I’ll try my best to explain what the Blue Man Group theatre show is like. In the Astor Place Theater, three bald blue men without ears put on a great show! These blue ‘creatures’ don’t speak, they actually don’t even make a sound. Their mission is to introduce their special gadgets to the audience, so be prepared for a fun night out full of surprises! Buying your theatre tickets online before going to New York is easy and it will save you time and money. This form of entertainment created by these three men is unique and you won’t find it anywhere else. By combining music, technology and comedy, they create a fun show that is suitable for all ages. The show started in 1991 and is one of the longest running off-Broadway productions in New York. I’m absolutely sure you’ll be laughing when you see how the blue men react to modern gadgets. They’re both curious and surprised. You’ll also be amazed by the sci-fi drum kits, LED-screen speech bubbles and other cool objects the group has created. You might think that this show isn’t for you, but I guarantee you’ll have fun night out at the theatre! 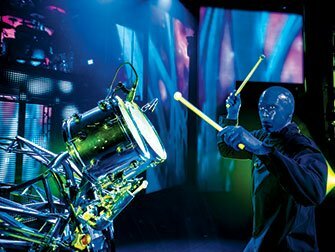 How to buy Blue Man Group in New York tickets? 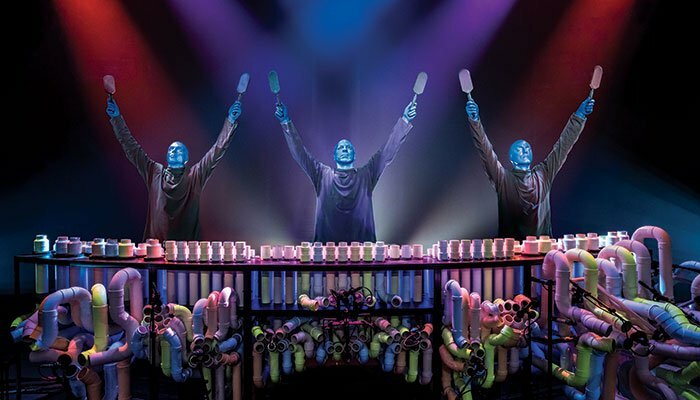 It is easy to buy tickets for Blue Man Group with the link below. I recommend buying tickets online before your trip to New York. Why? A lot of off-Broadway shows are very popular and are often sold out. You’ll also save time and money and most importantly you don’t have to stress about finding tickets when you are in New York. Eric’s Tip: Who hasn’t heard of the Blue Man Group? There’s a reason why the show is an international success; it’s extremely entertaining. It’s slapstick in it’s purest from, so be sure to bring the kids along! I sat in the poncho seats, nice and close to the stage …. If you’ve seen the Blue Man Group in Sydney then you won’t be seeing anything new, instead try STOMP. Don’t want to see Blue Man Group?